Gosaikunda has been included in the Langtang National park. Main Spring of Trisuli River is Gosaikunda Lake. 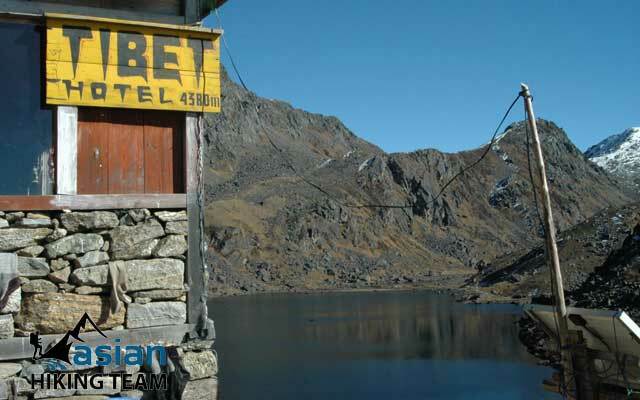 Gosaikunda is the side of several sacred Lakes that lie north from Kathmandu between Helambu and Langtang valley. Gosaikunda area is uninhabited for the most part, but every August as many as 50,000 pilgrims crowded into the area for a festival by a Lake that fingers prominently in Hindu mythology. Devotees come to take bathe in this Lake and to pray homage to Shiva. There are several legends all similar, concerning the formation of this lake and its significance. The fantastic view from Loribinayak Manaslu, Ganesh Himal and Langtang range are picturesque. 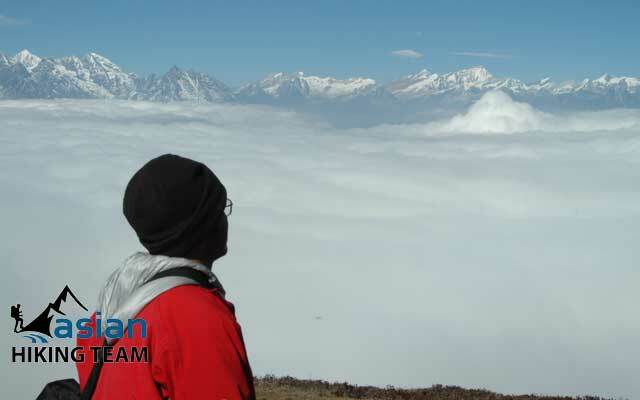 Gosaikunda trek start from Dhunche, 1950 meters, the district head quarter of Rashuwa, 4 to 6 hours drive from Kathmandu. 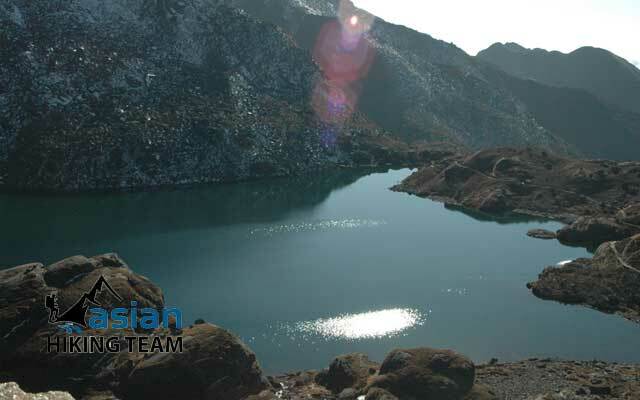 Two days trekking bring you the secrete Gosaikunda Lake 4180 meters with fantastic view from Loribinayak. Either you come same way as our itinerary or cross Loribina pass 4681 meters, 5 days trekking to Kathmandu or combine trek Langtang valley within extra 4 days. Day 01: Arrive Kathmandu, transfer to Hotel, trip briefing, overnight Kathmandu (BB). Day 02: Sightseeing in Kathmandu with city guide and Car overnight Kathmandu (BB). Day 03: Kathmandu to Dhunche [1950m] by tourist coach/Local bus, 5/8 hours, overnight Hotel (B/L/D). Day 04: Dhunche trek to Chandanbari [SingGomba), 4.30 hours, Overnight Lodge (B/L/D). Day 05: Trek to Gosaikunda  5.30 hours, Overnight lodge (B/L/D). Day 06: Trek to Lauribina 4 hours, overnight lodge (B/L/D). 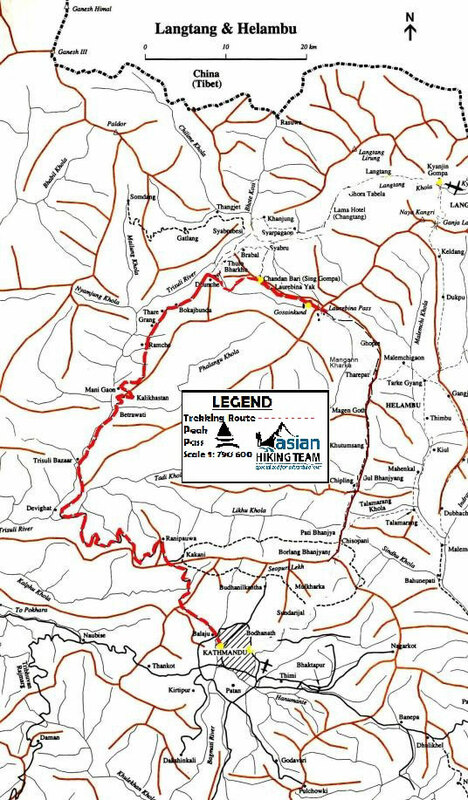 Day 07: Trek to Dhunche 4.30 hours, overnight lodge (B/L/D). Day 08: Drive to Kathmandu 5/7 hours, free day, overnight hotel (B/L). Day 09: Depart from Kathmandu as your schedule (B). 1 - 4 Pax US$ 595 per person. US$ 445 per person. 5 - 10 Pax US$ 528 per person. US$ 378 per person. Above 10 Pax US$ 490 per person. US$ 340 per person. * Deluxe Service includes attach Bathroom during the trekking and private trasport during the trip. The festival time the cost may change. Accommodation in Kathmandu 2 nights 3-4 star hotel with breakfast. International air ticket/ Nepal visa fee, Lunch and dinner in Kathmandu. Upon your arrival at the Tribhuvan international airport our representative welcomes you and assists to transfer in your hotel in Kathmandu, trip briefing, overnight in Hotel. Day 02: Sightseeing in Kathmandu with city guide and Car (BB). Kathmandu, being a historical and cultural heart of Nepal, is a popular destination for tourists, trekkers and adventure seekers. The city presents a wonderful mixture of Hinduism, Tibetan Buddhism and Western influence in the Valley. After breakfast at the hotel you will be leave for full day sightseeing tour to the world heritage sites in Kathmandu valley with English speaking city tour guide by private vehicle. You will be transfer to the pilgrimage sites of the Hindus temple Pashupatinath, one of the most important shrines of Shiva. Thousands of devotees, Saddhus (holy men/Baba) are surrounded here, and you can see the cremating system of the Hindus most of the times in the holy riverbank of Bagmati. Hundreds of monkeys are giggling with you and take a time to exploring surrounding areas. After visit Pashupatinath you will be transfer to the Bouddhanath Stupa a pilgrimage center which is the most popular and important place for Buddhist. You can explore with rounding prayer wheel and flattering colorful flag with melodious chanting noise. After your lunch at Bouddhanath visit another important place for Buddhist, Swoyambhunath stupa; also known as monkey temple covering wide range of area with highest point of Kathmandu valley and enjoy the 360 degrees of valley view. After exploring this spot you will transfer to Kathmandu Durbar Square which is the old royal palace of Kathmandu and can be seen lot of temple, Nepali traditional architectures and another attraction of this place is the Kumari (the living goddess). After finished your sightseeing trip you will be transferred to your hotel for overnight stay in Hotel. Day 03: Drive Kathmandu to Dhunche (1966m), 5/7 hours, overnight in Hotel (B/L/D). Drive by tourist coach/bus which takes about 5-7 hours. You head north out of Kathmandu driving through scenic foothills and ridge line vistas to Dhunche. The first part of drive up to Trishuli Bazaar is quite smooth. The path now moves along the gravel road. During the rainy season, the way is sometime blocked due to landslides. Your drive from Kathmandu to the destination is to be made by either local bus or land cruiser, Jeep, Overnight at hotel. Day 04: Trek from Dhunche to Sing Gompa (Chandanbari) 4.30 hours, overnight Lodge (B/L/D). The first part of the trails ascends gradually over mineral water factory up to Ghatte Khola (stream). Crossing a suspension bridge over this stream, you begin to trek steep up until you reach Sing Gompa through pine, silver oak and rhododendron forests with marijuana plants. There is an old cheese factory at Sing Gompa, Overnight at Lodge. Day 05: Trek from Sing Gompa to Gosaikunda (4361m), overnight lodge (B/L/D). Trek to Gosaikunda Which takes about five and half hours. The first part of the trails emerges gently ascent up to Lauribinayak and the top of Lauribinayak gives you an exotic feeling. Then the trails steeply ascend all the way to Gosaikunda. You follow a rugged trail with dramatic views; to the west Himal chuli (7893m) Manaslu range (8156mm), Ganesh Himal ranges (7406m), Tibetan peaks and Langtang Lirung. On a clear day, even the Annapurna range can be seen rising up behind and to the north across the valley is Langtang Lirung. Passing a few huts in the high pasture of Laurebinayak, cross a small ridge and have your first views of the holy lakes. There are about a dozen lakes in the Gosainkunda Basin, the main three being Saraswatikunda, Bhairabkunda, and Gosainkunda. According to legend, Gosainkunda was created by Shiva when he pierced a glacier with his trident to obtain water to quench his thirst after having swallowed a poison that threatened to destroy the world. Day 06: Trek from Gosaikunda to Lauribina 4 hours, Overnight Lodge (B/L/D). It takes about 3 and half hours trekking. The trails descend all the way with magnificent mountain views, Overnight Tea house/Lodge. Day 07: Trek from Lauribina to Dhunche 1950m, 4/5 hours, overnight lodge (B/L/D). Trek to Dhunche which takes about 4/5 hours. The first part of the trails descend through pine, silver oak and rhododendrons forests with marijuana plants up to you cross suspension bridge over the Sing Gompa Stream. Now the path stretches at flat level through some human settlements and mineral water factories up to Dhunche. It is a small town and headquarters of Rasuwa district, Overnight Hotel. Day 08: Drive from Dhunche to Kathmandu, overnight hotel (B/L). Early morning drive by tourist coach or local Bus, it takes about five to seven hours. It is a pleasant drive back to Kathmandu. Transfer to hotel, diner and last preparation. Day 09: Depart from Kathmandu or next trip (B). Final Departure or next trip as your schedule.